In 1905, a new operetta took Europe by storm -- The Merry Widow by Franz Lehár. In 1907 a new English-language production became a hit in both Britain and here on Broadway. In April 1908, when the play was starting to wind down in New York, the great Ferd Long of the New York Evening World reminded the newspaper-reading public about the play. 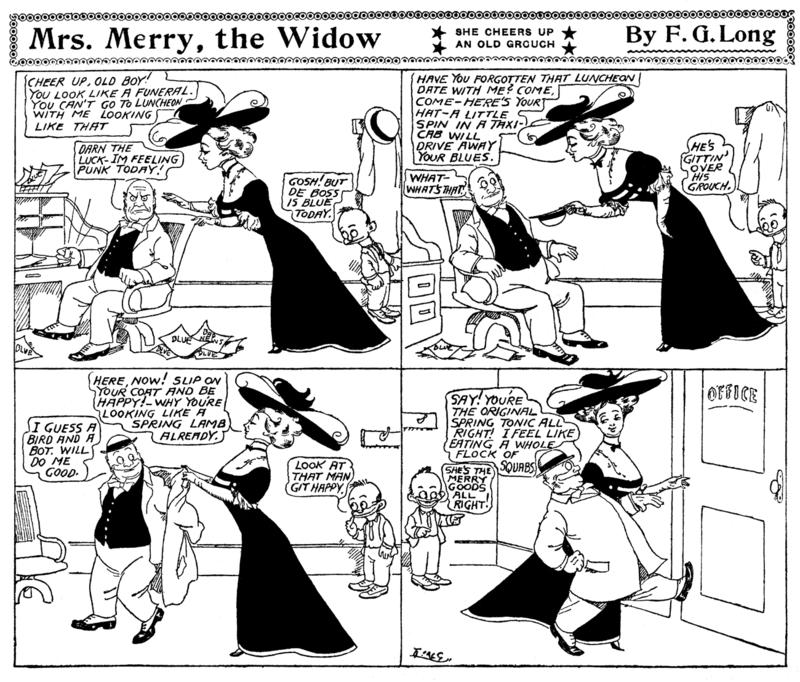 Long penned just two episodes of Mrs. Merry the Widow, on April 14th and 20th. There's no real gag involved, just the beautiful and charming widow being her beautiful and charming self. Maybe Long had seen the play and just felt the desire to draw the great lady in a strip, or maybe he was directed by the powers that be to give some promotion to the advertising theatre when ticket sales had begun to fall off a bit. The American Broadway production ran for 416 performances, finally closing in October 1908. Maybe Ferd Long was responsible for selling a few tickets, maybe not. All I can add is that if the Broadway production had been cast with the eye-poppingly gorgeous Lily Elsie of the British production in the title role, rather than Margaret Dumont lookalike Ethel Jackson, I bet the operetta would have lasted a good while longer here.